The coach is one of three built from TMD now SSM Kits, this coach was the last to be completed and definitely a Friday afternoon or Monday morning job. I decided to finish the ventilators in chrome and lost one during the final assembly , the roof did not sit properly as I managed to cross tread one of the locating nuts. Weshty came up with the goods with a couple of replacement ventilators even though he did not supply the coaches or own the TMD side of the business at the time. 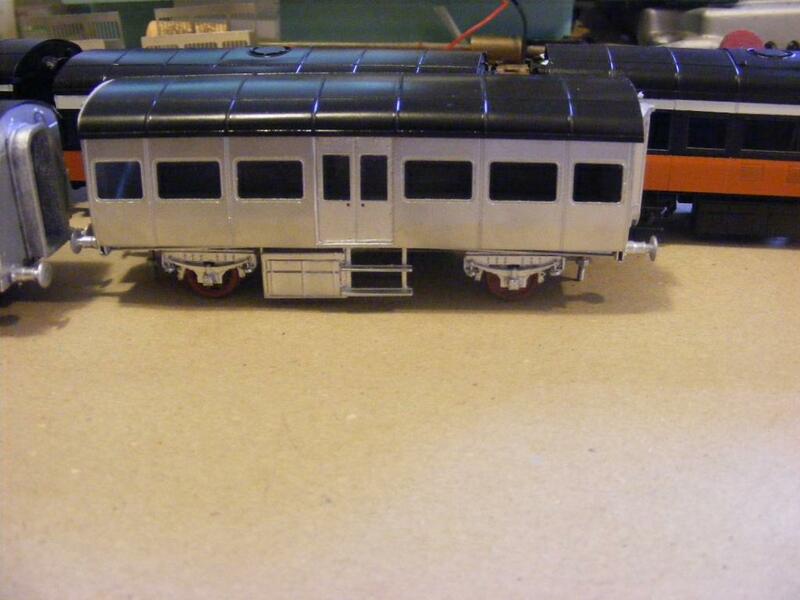 Eventually got around to fitting the ventilator and fixing the roof. The Kits are supplied in GSR condition I don't know if the ventilators were chrome plated in CIE days or if the rotary roof vents and air condition in 1st class compartments were retained. In the 1950s CIE tended to mix and match modern and older stock the general idea is to build a couple of rakes with a mix of these and older wooden panelled GSWR & MGWR stock. About 10 years ago I bought a couple of Worsley Works Laminates and a Park Royal. These were basically scratch builders parts and they kind of went through the wars before I came up with a half reasonable way of forming a roof. Most of the fittings are from Comet of MJT the biggest error is the BR heavyweight bogies and bodgery along the roof line. Assembling the Worsley Works parts and sorting out the details did not take long, but forming the roofs tuned out to be a major saga all because Irish coaches were a lot wider than the UK. I also managed to do quite a bit of damage tot the sides during the assembly. I took an each way bet with these coaches and painted one side black and tan the other green. I could probably add another couple of Park Royals or Laminates, probably use a formed metal roof, if I was doing two or more it would probably be worth while to do a moulded interior. Then again 2-3 coaches was pretty much the norm on secondary routes and branches and I may be better to concentrate on some more older stock. Any guidance John, on how to crack this problem inherent in building Allen Doherty's kits, would be most welcome? I basically widened Comet BR MK1 roofs for the Laminates & Park Royals by splitting them down the middle, filling the gap with car body filler and a lot of sanding. These days I would form the roof in metal using bending bars and a wooden template. The GNR and UTA coaches are less of a problem and in some cases Worsley Works sides and ends can be used to re-skin Bachmann LMS coaches. SSM also supply roof & castings suitable for some of the Worsley Works GNR coaches. 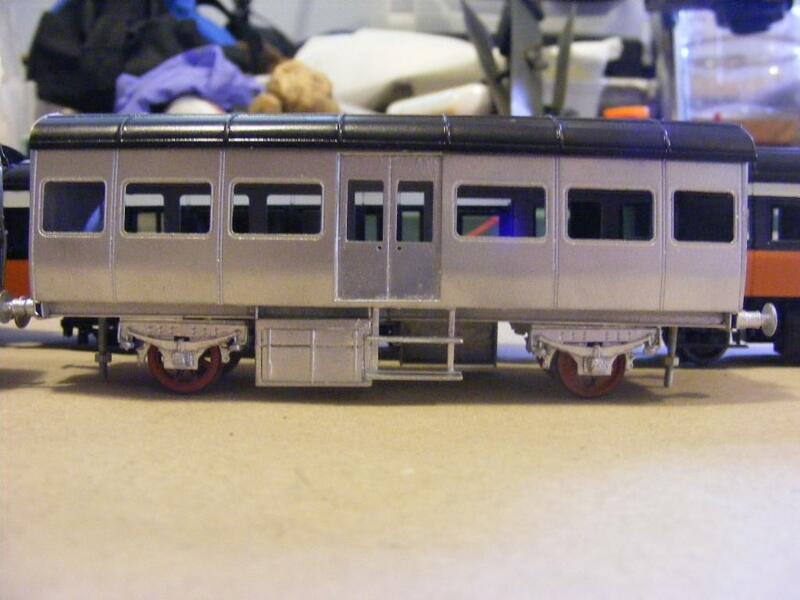 I have tried to finish a couple of vans in the 1950s silver livery. 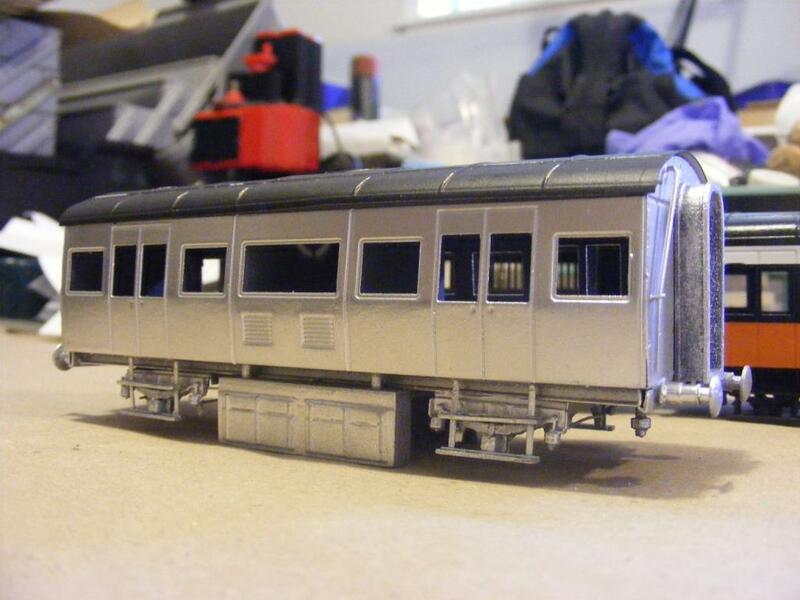 The coaches livery was described as unpainted aluminium probably aluminium with a clear protective lacquer. The heating van was the original study model for the kit complete with 3D battery box and gangways. I used a bright aluminium automotive aerosol the finish is reasonable despite a few false starts. Looking at Des Cockham's Irish Broad Gauge Carriages the vans seem to have been an in all over silver when introduced into service . The weathering on the heating van should be interesting the combination of rain, boiler exhaust, diesel and muck thrown up from the track, the luggage vans do not appear to have got as bad as the heating vans. looks Smashing John. Silver is a bugger of a colour to do!. First time I've seen any coaching stock in silver in model firm - very impressive! It weathered spectacularly badly, hence the later repaints into green. Small point - roofs would be silver too rather than black, but in practice the whole van became a nondescript dirty colour all over very quickly. Out of interest, I must make enquiries about clear lacquer - never thought of that. Those vans are a credit to to you, Mayner - excellent stuff. I would imagine the "silver" livery was inspired by American streamliners with stainless steel stock, like the black and tan of the 1960s & current greens CIE was trying to make a brake from the negative pubic image of the old railway with dirty clapped out locos and rolling stock. Its interesting that the factory paint finish on the Metrovicks & BRCW Sulzers seem to have got into a worse state than the Inchacore built coaching stock. Love the carriages they look great. The Tin Van is amazing. shes beautiful in silver john - better than i thought! Well we have to wait and see first. Decent end shot of a silver tin van here, John... you can just make out the silver roof, too. I had fun and game trying to get an acceptable finish with the silver initially tried an automotive aerosol before trying a Tayiama flat silver enamel with much better results. Starting to look the part luggage van. SSM did a custom sheet of red numerals and letters for the silver vans. Flotilla of black & tan vans nearly ready for launch. Finishing these though a lot longer than expected mainly due to extremely humid conditions, in the evenings masking tape would not remain stuck to the model let alone paint . Decided on a SSM Inspection Car for a quick an simple project I could complete, also had a 35mm Blackbeetle out of a G Class. Swapped around the Lomac wheels for the 3' wheels supplied with the bogie. Could not resist the idea of a detailed interior with those deck chair seats, for a jaunt to size up the state of the track. Not sure if it was my Beetle the bogie was not symmetrical had to trim off a piece of the end of the gearbox at one end and cut off the pivot pin and raised boss in the centre. 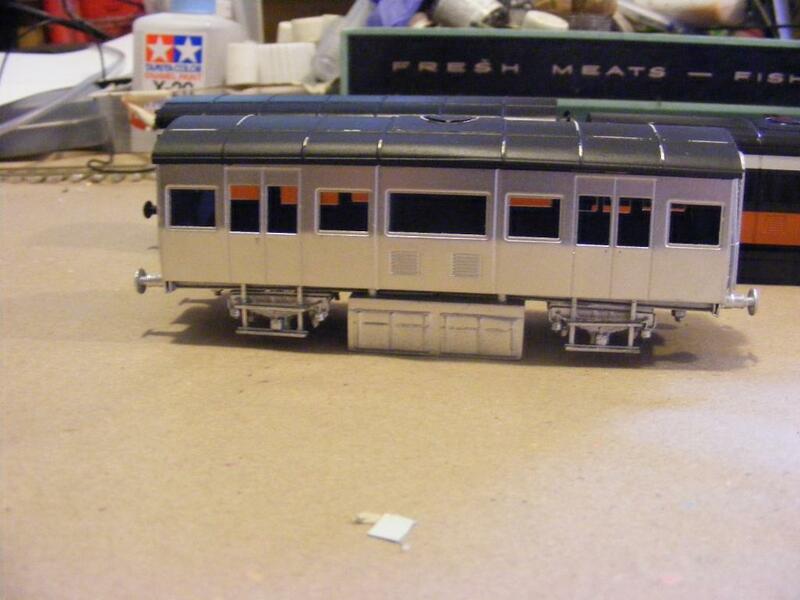 Its important to do a trial fit with the floor and power bogie to get the model to sit at the right height. As a late Christmas present I treated myself to a portable spray booth does a great job. 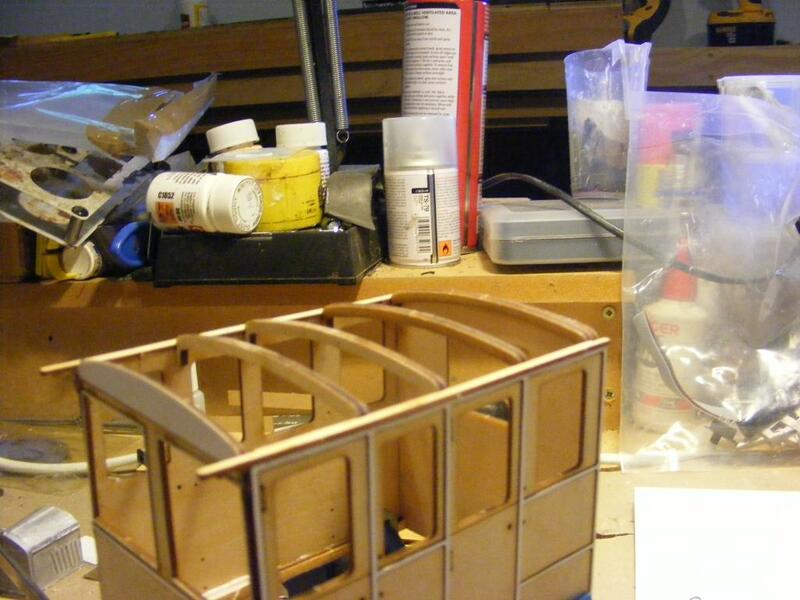 To reduce paint build up inside the booth I line the base and sides with kraft paper,. I finally finished the tins. I ended up stripping down and re-painting the silver van, the original paint job looked good but tended to scratch if you looked at it, second time around seems a lot better. The Blackbeetle was robbed from a Duetz which is due to get a 21mm gauge 28:1 version to get some decent low power torque as a shunter. Workbench more or less clear narrow gauge layout set up temporarily in background. Great work. The vans look amazing and the inspection car is so cute. I totally agree it looks absolutely suberb! Carrying on with the carriage shop thread after 5 years 5L finally got some glazing to keep out the driving Westerlies and the cold blowing in from the Steeps of Russia. I spent one winter working on in Drumsna and man it gets cold. There was a noticeable gap between the body side and roof on this coach so the glazing was brought up slighty above the level of the sides, scribed then folded slightly the folded bit touched in in one of Floquils 1000 shades of Railroad Black probem solved. The glazing is secured in place with double-sided tape which does not appear to have the drawbacks of superglue or crystal clear. End swing may be a problem with this coach on curves and I may need to re-lay the curve between the station and the roadside section as the C&L 4-4-0T tend to stick at one particular spot on the curve. I am completing some long outstanding jobs on the narrow gauge before moving the layout back into the house, including getting the turntable into working order. The table is a Peco HOm model, I looked at fitting a motor, but ended up copying a C J Freezer design from 1960 using Meccano gears and parts. The conversion turned out simple enough, 1st making sure the Peco turntable pit was nice and flat and the table revolved freely. The spigot from the Peco turntable is designed to fit over a Meccano 8SWG axle or rod. I was able to get all the necessary parts from the local Mecanno parts supplier though the gears are plastic rather than metal. The biggest job was pinning the axle and spigot with a piece of .8mm brass. drilling through the spigot and mild steel rod using a Dremel pillar drill, otherwise even if you Loctite there is a fair chance the spindles will shift. The turntable pit is basically designed to sit into a circular hole cut in the baseboard, leaving the deck with very little in the way of support. I ran a strip of softwood across the underside of the pit with an oversized hole bored out for the pivot. The turntable base was then screwed down to the strip with some small wood screws possibly 12mm No4. I used a slotted Meccano strip as the lower bearing for the pivot, this can be tricky to set up as the turntable deck has to be completely level. The Meccano collar and washer is to prevent the table rising up and keep the deck power pick up system in compression. With the Peco N & HOm turntables the rails pick up power off a split ring using sprung brass plungers. Setting up the worm gear drive is simple enough I used Meccano Trunnions to support the worm shaft with a hand wheel on the fascia to spin the engine around. I use "Blue Point" actuators which are basically a hand operated version of the Tortoise point motor to change frog polarity and to switch power between different track circuits, with RC rudder linkages to push and pull rods on the layout fascia to control the points. Besides the turntable there is a lot of scope for detailing around the loco shed, coal stage, basic interior detailing and ash and general loco shed muck. The carriage shops have been kept busy overhauling and upgrading rolling stock with a 'new' passenger train for the narrow gauge and HOn3 couplings and SSM lettering for freight rolling stock. In the early 1950s CIE transferred an ex T&D van and a coach from the West Clare to the C&L for use on the main line, it looks like another set may have been transferred or the van strayed from the main line onto the Arigna-Sligo branch. The model is a Backwoods kit dating from around 94, more or less as built, airbrush painted in a Humbrol green and Railmatch weathered black. I need to replace the snail without damaging the paint work. The GSR/CIE "cascaded" several T&D bogie coaches to the West Clare to replace the indigenous 6 wheelers which were in turn replaced by diesel railcars. The T&D coaches seem to have been a standard narrow gauge design similar to coaches supplied to the Muskerry & North Wales Narrow Gauge. Although bogie the wooden longitudinal seats were unlikely to be an improvement on the West Clare 6 wheelers and original C&L bogie stock. I think the body was painted with a motor aerosol and finally was recently fitted with floor, seating and glazing following complaints from passengers. The convertibles were originally built from Backwoods kits in early 96 in Carrick on Shannon and painted in automotive aerosol grey primer. Before lettering the models were coated with Clear Coat Gloss using the airbrush and sealed with Testors Dullcoat aerosol. Despite the run-down locos and coaches, C&L wagon stock seems to have been maintained to a reasonable standard right up to the end of narrow gauge operation. While passenger traffic was light on the Belturbet and Arigna lines general goods and coal traffic appears to have been reasonably heavy. SSM prepared a custom deal set enough for my current wagon fleet and some additions. Most of the stock is now fitted with Kadee HOn3 couplers, a bit fiddly to assemble but mush more reliable than the N Scale couplers previously used. There's a special place in my heart for d'oul T&D. Lovely job on those carriages and great to see the Branchline kits done up. Thanks for the shoutout John. In a way the T&D is best supported of the Irish Lines with John Campbells large scale models a largish range of small size kits. The two CVR coaches need fitting with interiors, glazing and lettering and the rather impossibly tall looking horsebox is in for a rebuild and re-paint, all that's needed is a tram loco or diesel tractor to pull them. Juicy stuff John. Will look forward to seeing more. High summer here and easy to forget you are in prime modelling time down under. I decided to try out I P Engineering Tralee & Dingle inspection railcar while looking at a possible change in modelling direction. http://www.ipengineering.co.uk/page4.html the kit is in laser cut ply construction and includes wheels, motor and detail parts to complete a working model. Body assembly is relatively straightforward with accurately cut ply parts and some nice whitemetal castings. Although the instructions recommend superglue, I used PVA for assembling the ply parts. The corner clamps (Micromark) are essential for supporting the joints while the joints are curing. Roof construction is similar in principal to full size traditional carriage construction with the roof boards supported by ribs. The planking on the coved section immediately above the gutter is fixed first and allowed to cure before filling in the arc section in the centre. I P recommend Kleenex tissue fixed with PVA to represent the canvas roof covering, model aeroplane glider tissue fixed with dope is probably a better alternative. Its nearly a shame to hide the interior planking. Ah John, that's only lovely. Real, wooden, carriage building in miniature. Love all the latts doing their bit. Well done. Very nice. Would that be a Ford 040-T by any chance? Nothing to report on the small scale side in recent weeks, mainly focused on the workshop installing a permanent power supply to the work bench and sourcing parts for the Unimat, buying a lathe/milling machine is only half the cost. I used the Unimat in anger for the first time when I turned a couple of silver steel replacement valve gear pins for a G Scale 2-6-0. 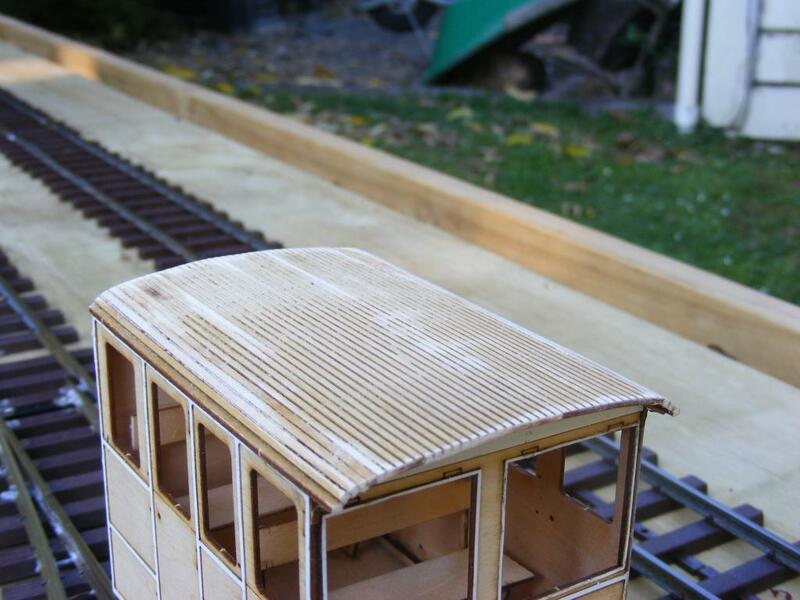 The Dinge Railcar and a G Scale 2-8-0 are the main priorities at the moment. The railcar is urgently required to replace the Bachmann railtruck on the mails after the final drive gave up , parts for rear axle out of stock, the 2-8-0 has been out of service for over 5 years and is needed before the smaller engines wear out. Fresh from the paint shop. I am planning to build a separate chassis in nickel silver with a Northyard or North West Shortline gearbox as I am not 100% happy with the design of the kit chassis. Railcar posed on the main line outside the engine shed. The body is finished with aerosol car paint, in an attempt to get something close to the GSWR/GSR purple lake. The finish coat was applied over several layers of red oxide primer filler sanding down between coats. The ply required a lot of filling and sanding, I would have probably would have been better and faster to scratchbuild the body in plasticard. Close up of railcar Most of the weight is over the front axle with the whitemetal bonnet and castings. Roof to be painted dark grey/dirtyblack, grab handles, door knobs and glazing to be fitted. Some US narrow gauge lines ran similar railcars. Rebuild of Bachmann 2-8-0 into DRGW C25 The Bachmann large scale 2-8-0 was out of proportion to Bachmann Big Haulier and LGB American narrow gauge locos and stock. The rebuild is intended to improve the proportions with more typical North American details than the Mexican or South American look of the stock Bachmann engine. The cab took approx. one week to do laminated in 3 layers from 0.030", 0.060" & 0.030" Evergreen plastic sheet. The 3 ply construction is to resist warping and buckling, allow for detail relief and glazing rebates. When working in plasticard I usually stick the working drawing to the plasticard with glue stick or schoolglue then mark out/scribe with a Stanley knife or craft knife using a sharp blade and a straight edge. Apart from the cab the main visual changes to the loco were replacing the funnel, raising the headlamp, shortening the front platform by 1/2", narrowing the overall width of the loco and tender by a similar amount and removing the outside Baker valve gear on the loco, the DRGW engine had inside Stephensons gear. This loco will be fitted up either with on board battery radio control or wired for DCC with some form of "keep alive" decoder, even with pick up on all wheels reliable pick up on a garden railway can be a problem particularly in conditions of high humidity, i.e. most of the year! Never get this with Woodland Scenics! The problem is not so much that there is rhubarb on the line, as that it is the wrong kind of rhubarb, or - perhaps more accurately - that it is to the wrong scale. Never mind: another week or two and it should be tall enough to send a train under.